Can you see now how utterly useless Wind Power is? God, how stupid have we become? 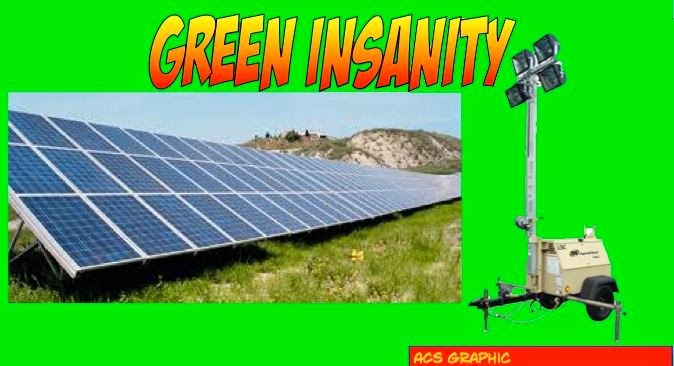 Now let's look at the stupidity of Solar Power. The subsidies for "Green Energy" are so great that it pays to use diesel generators to power floodlights.The floodlights then light photovoltaic cells that produce power to keep the money flowing in from the subsidies. After press reports, it was established during inspections that several solar power plants were generating current and feeding it into the network at night. To simulate a larger installation capacity, the operators connected diesel generators. "This is just the tip of the iceberg," said one industry expert to the newspaper "El Mundo", which brought the scandal to light. If solar systems apparently produce current in the dark, it will be noticed sooner or later. However, if electricity generators were connected during daytime, the swindle would hardly be noticed. As I said last time around, this is the insanity of greenery.